Filmmaker and activist Michael Moore is taking his tough, anti-Donald Trump talk to Broadway. The Academy Award-winning director of "Bowling for Columbine" will perform the one-man show "The Terms of My Surrender" at the Belasco Theatre starting July 28 for 12 weeks. Moore on Monday promised a very topical show that has a subversive, urgent tone. Not all of it will be scripted, some of it will riff on events of the day and it may have guests and interactive elements. Tony winner Michael Mayer will direct. While not all of the show will be an extended rant against Trump, Moore called it a "comedy shiv" pointed at the administration and performed only a few blocks from Trump Tower. The show's tagline is "Can a Broadway show take down a sitting President?" "I operate under the hope that he won't be president for very long," Moore said. "Why don't we see if every night — and twice in the afternoon — for 12 weeks if a piece of theater can raise enough of a ruckus to discombobulate the man sitting in the Oval Office? I don't know, but I'd like to find out." He added: "Stranger things have happened in the last year." 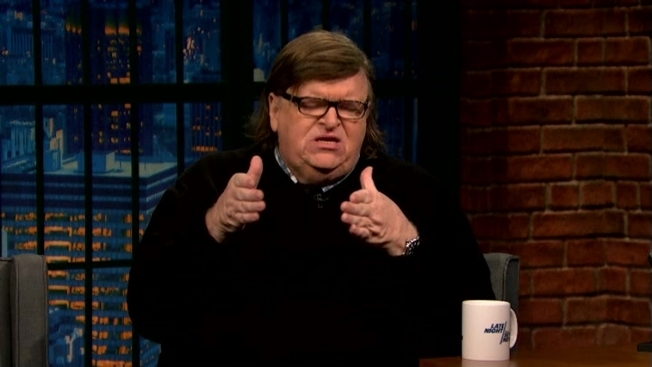 While Moore had a one-man show about the 2016 election called "Michael Moore In TrumpLand," the filmmaker said "The Terms of My Surrender" will be composed of completely original material. Moore directed and produced "Fahrenheit 9/11," a critical look at the presidency of George W. Bush, and "Sicko," which examines health care in the United States. The filmmaker, who famously predicted a Trump victory last summer, said liberals need to embrace comedy as a way to halt any Trump momentum. "We need an army of satirists," Moore said. "His Achilles heel is his very, very, very thin skin." When asked if he was preaching to the choir by lambasting Trump in a liberal city and in a very liberal Broadway community, Moore responded: "Sometimes the choir needs a song to sing." Moore's show joins a list of theater pieces coming in seeming response to the new administration. Robert Schenkkan's play "Building the Wall," which imagines Trump's presidency taking a darkly authoritarian turn, has an off-Broadway run in May. Also planned for Broadway is a pair of starkly political works — a revival of Henrik Ibsen's "An Enemy of the People," about a well-intentioned whistleblower eventually branded a traitor, and a stage version of George Orwell's nightmarish "1984" that is scheduled to open in June at the Hudson Theatre.